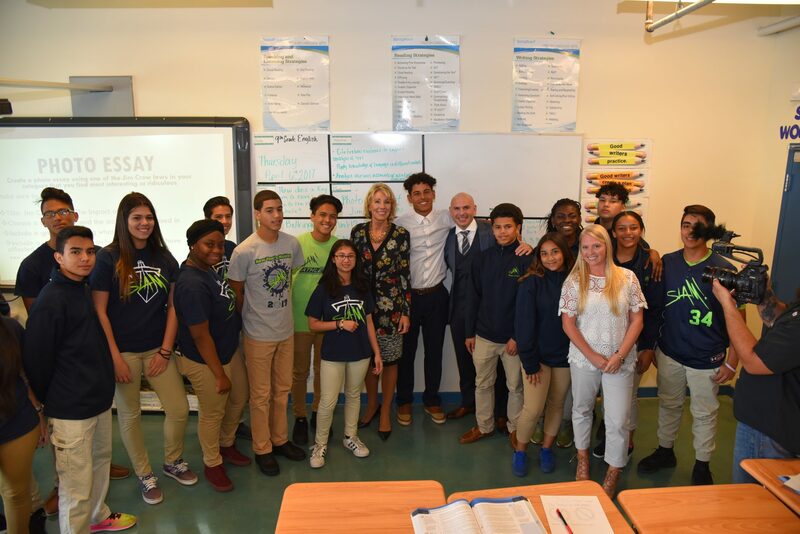 Miami, FL — On April 6, 2017, Betsy DeVos, the US Secretary of Education, visited SLAM Academy, a public charter school that is closing the achievement gap and preparing students for college. SLAM ambassador and founder, Armando Perez (Pitbull), joined her on a tour of the campus. They visited classrooms, stopped by an Honor Roll ceremony where more than 170 students were recognized for their academic achievement and spoke with students who are part of the school’s dual enrollment program. “Thanks to the encouragement and guidance I received at SLAM, I am the first in my family to attend college,” explained Francis Cruz to Secretary DeVos. A senior with an impressive academic and athletic track record, Francis has earned college credits through SLAM’s dual enrollment program and has been accepted several state colleges already. She plans to major in biology in the fall. The Secretary also spoke with Alfonso “AJ” Alvarez, a junior at the school. She was so impressed with him that he was offered him an internship with the Department of Education in Washington, D.C. this summer. US Secretary of Education Besty DeVos meets students, AJ Alvarez and Francis Cruz, during her visit to SLAM Academy. In 2013, , an innovative middle/high school opened its doors in Miami’s urban core. The tuition-free public, college-prep charter school became a beacon of hope and opportunity for neighborhood kids — offe ring them high-quality academic programs. According to data from the Florida Department of Education, the English Language Arts (ELA) and Math proficiency of students at SLAM on state assessments exceeds peers at neighboring schools. SLAM is also graduating these student populations at much higher rates than the local district and state. SLAM’s graduation rate of 92.4% exceeds District (80.4%) and State (80.7%) averages. The graduation rate of Hispanic students at SLAM (93%) surpasses the District (81%), State (73%), and national (76%) average for Hispanics. In addition, the graduation rate of low-income students at SLAM (88%) also surpasses the district, state and national averages. Located just blocks from the Marlins Ballpark in a low-income minority neighborhood, SLAM is transforming the lives of students. Prior to attending SLAM, a vast majority of the student population lacked access to high-quality college preparatory programs. SLAM is successfully closing the achievement gap and increasing the level of education, especially for minority and economically disadvantaged students.